Fireplace North & Spa would like to welcome Nordic Hot Tubs to our family of spas. If you are looking for a budget-friendly tub, with quality parts and come in a range of sizes that fit 2, 3, 5 or more people, look no further than a Nordic. Whenever you buy from Fireplace North & Spa, we will be there to provide delivery and service after the sale if needed. Nordic hot tubs come with a 3 year limited warranty. Stop in or give us a call to learn more and obtain pricing. 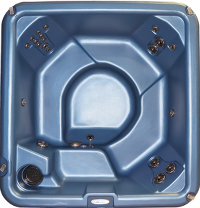 Looking for a quality hot tub at a cost-effective price? Look no further than a Nordic Hot Tub. various round models, along with their square tubs. We always recommend the T-20 Insulation package for all hot tubs in Michigan or Wisconsin. Their manufacturing facility is based in Grand Rapids, MI.